Located in the state of Florida, Temple Terrace is a mid-sized city with a population of 25,654 people. In Temple Terrace, there are 3,569 people per square mile, which is well above the national population density average. According to the most recent Census, 68% of Temple Terrace residents are White, 21% Black and 5% Asian. Living in Temple Terrace can be a positive experience for anyone moving to the area. Having said that, in the state of Florida, there are many incredible places to live, so choose wisely! The best areas in Temple Terrace and in surrounding cities are easier to find when you are able to make informed decisions. Using data from amenities, crime, weather, education, housing, you will see a detailed breakdown of the most important information as well as comparisons to the Florida and national averages. Temple Terrace has a livability score of 81 out of 100 and is ranked #131 in Florida and #1,275 in the USA. Pack your bags! This is a very high score in comparison to other US cities. Living in Temple Terrace could be a great choice! Another exciting tidbit, is that Temple Terrace ranks better than 90% of all US cities! Based on the rankings for each individual category, Temple Terrace has received high marks for amenities (A+), weather (A) and housing (A). 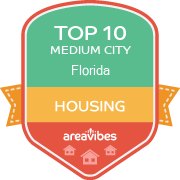 Based on the proximity of local amenities like grocery stores, restaurants, coffee shops, parks, librairies, etc., Temple Terrace has received a higher than average score for its local amenities. If you’re planning on relocating and making this area your permanent home, it’s nice to know that there is an ample amount of amenities and things to do within walking distance or a short drive. Based on multiple factors including: median home and rental prices, appreciation rates and home affordability, Temple Terrace has received high marks in the housing category. Based on these calculations, the apartment rental and real estate market appears to be very healthy. Assuming that Temple Terrace meets all of your requirements, the next most important item to examine is the affordability of real estate in Temple Terrace. Everything else becomes a lot less important if it turns out that home prices in Temple Terrace are simply unattainable. The median home price for Temple Terrace homes is $174,900, which is 4.9% higher than the Florida average. If we take a closer look at the affordability of homes in Temple Terrace, we’ll see that the home price to income ratio is 3.1, which is 8.8% lower than the Florida average. Knowing if your home will appreciate on a long term or even a short term basis should be factored into your decision making. An increase in your home’s value can be a good way to generate tax-free equity that can create long term financial security. In the past year, appreciation rates for homes in the Temple Terrace area were 9.4% and 5 year appreciation rates were 13.2%. How Do You Rate The Livability In Temple Terrace? Living in Temple Terrace really is the dream in the Tampa Bay Area. I am right in the middle of everything I could imagine. I am a short distance away from the beaches in Sarasota, and not a far car ride from Orlando where I can access huge attractions like Disney World and Universal Studios. However, there is much to do right in the middle of Temple Terrace like visiting Busch Gardens, the Tampa Bay Zoo, or the Museum of Science and Industry, or MOSI as we like to refer to it. Some of the best areas of Temple Terrace are right in the middle. The University of South Florida is in heart of town, attracting great young minds to live and grow here, and eventually adding to our workforce. Across the street is MOSI, which has recently been renovated. There is lots of work available between all of the restaurants and the University Mall, along with corporate businesses of all types. This city is easy to navigate with highway access all over to get me where I need to go. Source: The Temple Terrace, FL data and statistics displayed above are derived from the 2016 United States Census Bureau American Community Survey (ACS).